4 Bedroom Terraced House For Sale in London for Asking Price £765,000. A beautifully presented four bedroom property with accommodation set over three floors. 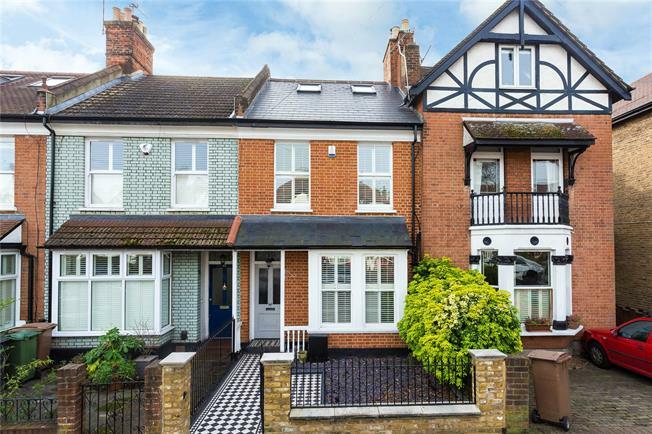 This lovely period property offers high ceilings and period features throughout starting from the well-kept front garden with black and white tiled pathway. Inside to the ground floor there is a double length lounge with stripped wooden flooring and a feature fireplace complete with wood burner, to the rear is the spacious kitchen/diner with an innovative study area, a cloakroom and bi fold doors to the garden. The first floor offers three double bedrooms and the luxury family bathroom. To the upper floor is the master suite with bespoke fitted storage and en suite bathroom. Outside to the rear of the property the stone patio steps down on to the low maintenance lawn which leads to the versatile summer house benefiting from electrics and power. Just behind the summer house there is access out to the road which is an added benefit to this property. Station road with its array of shops, restaurants and amenities is close by and the mainline station with links to London Liverpool Street is within 0.2 miles.